plus more than 150 camera and lens reviews, and growing. One example of what mirrorless cameras can do (Fujifilm X-T1). Other examples can be found in the gallery. This site covers all mirrorless cameras and related products and is updated nearly daily. Canon and Nikon DSLR cameras are covered on dslrbodies.com, and also updated nearly daily. 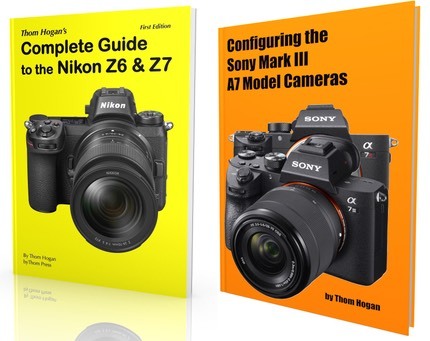 Thorough and thoughtful reviews by technologist and photographer Thom Hogan of mirrorless cameras from Canon, Fujifilm, Nikon, Olympus, Panasonic, Samsung, and Sony cameras. Full analysis of the handling and performance of these cameras. Reviews of Canon EOS M mount, Fujifilm X mount, Nikon CX (1) and Z mount, Olympus and Panasonic m4/3 mount, Samsung NX, and Sony E and FE-mount lenses. Non-nonsense descriptions of how these lenses perform. This site began in 2011 after I’d been using m4/3 mirrorless cameras in my photography work for two years. Since then, I’ve expanded the site to its current form, where it covers the entire mirrorless camera marketplace in a way no other Web property does. The sensors are large. So are the possibilities. Don't be fooled by the simple look of this site: it's filled with articles, reviews, data, and more, with even more coming in the future. Help me improve this site. If you find incorrect or incomplete information, let me know. Use the email contact at the bottom of this page to let me know what you found (link after Copyright message).